At Arches, visitors are not supposed to climb on any formation with a name. A sign at the trailhead of this particular formation specifically declares in red print, “Climbing on Balanced Rock or its base is prohibited.” The day we visited, two young men had either failed to get the message or just didn’t care because they had climbed Balanced Rock. They were a good ways up the Dewey Bridge Member, looking like tiny insects high on the formation. 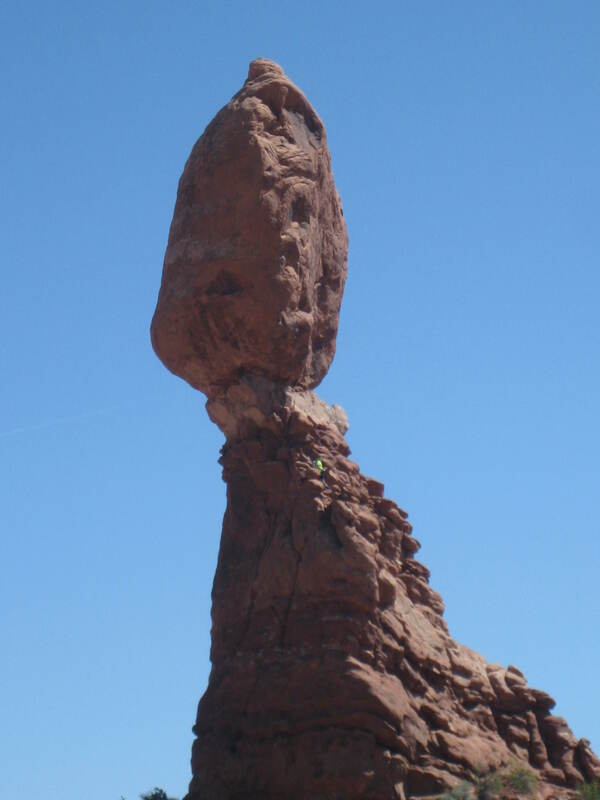 Can you see the tiny little man in the neon yellow shirt way up there on Balanced Rock? I was worried for the safety of the young men, and I was perturbed by their flagrant disregard of the rules. I’m not one for rules for their own sake, but I’m sure people climbing on the rocks wear them down, and even minute damage would be amplified if only a fraction of the one million visitors each year climbed on them. Prohibiting visitors from climbing on the popular, easily accessible formations certainly protects the rocks. The prohibition against climbing surely helps people too. It’s all fun and games until someone slips and falls from 50 feet up, crashes to the ground smashing his/her skull and other important bones, and lies on the ground in excruciating pain while waiting for an ambulance to make a thirty minute drive into and through the park so the EMTs can load the injured party into the ambulance for a ride to the nearest hospital. On the other hand, it was exhilarating to watch those bold souls standing so high on Balanced Rock. Of course, I knew the rocks were massive, but seeing humans scrambling around on them helped me understand how huge they really were. The young men were nearly insignificant next to the immensity of the rocks. I was relieved when the young men returned to the ground. Even though they were rule breakers and daredevils, I didn’t want to see them fall. They may have been wrong to climb balanced Rock but the story of their visit is exceedingly more exciting than my story. There’s an easy path around Balanced Rock, and The Lady and I walked it so we could look at the formation from many different angles. I was amazed by how different the formation looked depending on where we stood in relation to it. 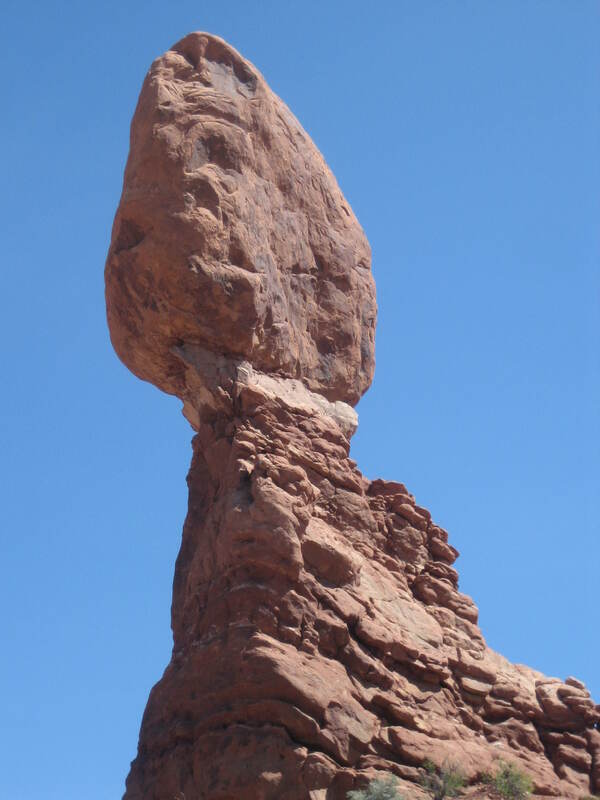 Of course, I had a theoretical understanding of how the look of something changes in relation to the viewer’s proximity to it, but it was fascinating to experience the phenomenon myself in relation to Balanced Rock. 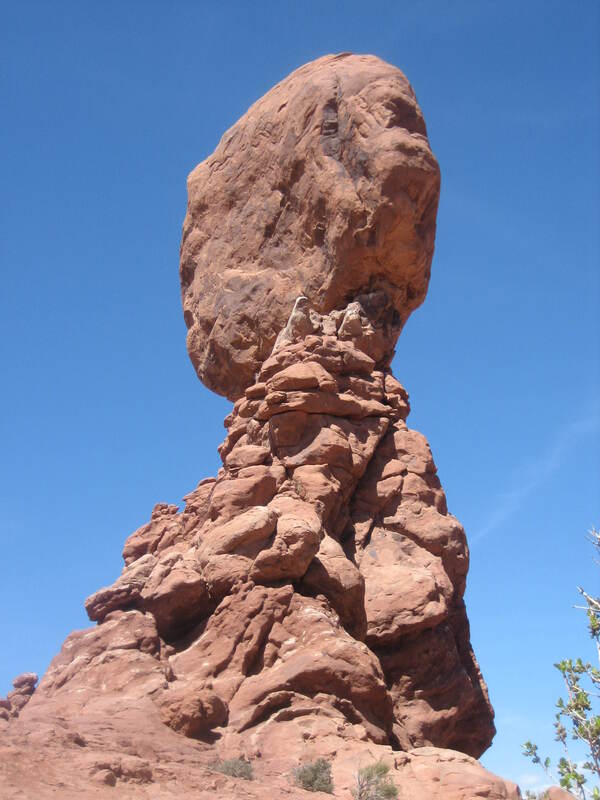 One day, the underlying layer of mudstone will erode to the point it can no longer support the caprock of Entrada sandstone, and the caprock will fall to the ground. How soon that will happen, no one knows. What if it happens within our lifetime? The Lady and I asked each other. We agreed we were glad we’d seen it as it stood on the early April day of 2018, and we’d be even happier to have seen it if the capstone falls during our lifetimes. Do you think they’ll change its name when the top stone falls? we wondered. The Park Service will have to post new informational signs if the capstone falls. 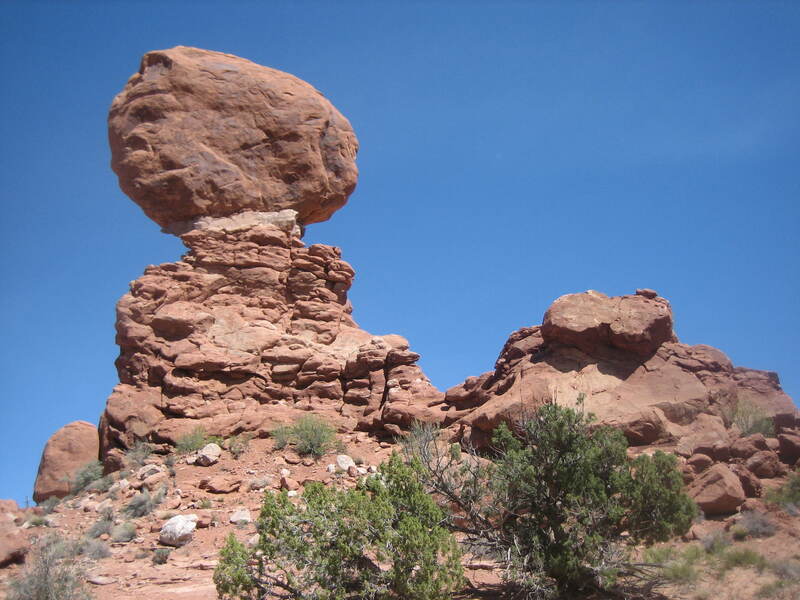 Of course, Balanced Rock may stay balanced for a good long time. When it falls, there may no longer be a Park Service or a United States of America or civilization as we know it. It may fall in a lonely landscape with no humans around to see or hear the first moments in its next state of existence.